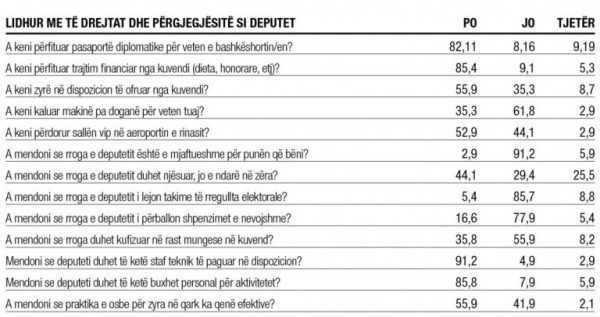 A survey conducted by the Institute of Political Studies (IPS) with 70 percent of MPs in the Albanian Parliament shows that half of their spouse (s) are employed in the state sector. The survey conducted by the ISP includes the data of SP, PD, SMI and PDIU MPs, including the fact that some of them were notedly reserved. Based on responses it turned out that one-third of the deputies state that their spouse is not engage in political parties or political leadership positions, and two-thirds are also outside politics, but in various public engagements. Only 2.9% confirm the opposite. Regarding labor relations, 8.8% of MPs claim to be unemployed, ie they have no contractual employment engagement in the state or in the private sector. While the rest of the respondents result in professions as economists and lawyers with11.8%, being businessman or engaged as lecturer in universities. "Regarding the state-private engagements, it turns out that the MPs sposes employment in the state sector is dominant (50%) and 35% in private sector. The employment in the state sector is a feature expressed in all MPs, but with special emphasis on majority MPs, where the percentage in the state sector reaches up to 70% of the respondents, whereas the private employment is mostly indicative of a part of the opposition MPs," says the ISP survey. In the survey conducted directly with MPs in 2018, it turned out that 65% of MPs declared unequivocally their religious identity, while 35% declare it in mixed forms, atheists or religious beliefs mixed because of their different religious beliefs of their parents and personal preferences. In order to identify a dominant religious belief for themselves, the answers were the most varied - from the "liberal Muslim" to the "converted Christian", "Protestant" and to the "The Albanian religion is Albanian". While they are open to expressing their education, the Albanian MPs are more reserved with regard to their children's education. Deputies were asked whether their children are studying internally or abroad, 2/3 of MPs refused to provide this information. Of those who provided information, it turned out that 26.5% of the deputies sent their children to high school or high schools within the country and 17.6% sent their children to schools abroad. Among other responses the MPs provided different alternative variants, such as one year in the state and two years in private or some time abroad, but then in the schools at home. Overall, without the importance of details, the picture of the deputies shows that the preference was to send their children to private schools and that the percentage of those who have sent their children to schools abroad is relatively much higher compared to the voting population. As far as financial treatment is concerned, even though they have the highest salaries in Albania, the elected people say they are dissatisfied with their financial treatment. So 92 percent think they receive insufficient salaries, where 77 percent of them say they cannot afford the spendings with the actual salaries. 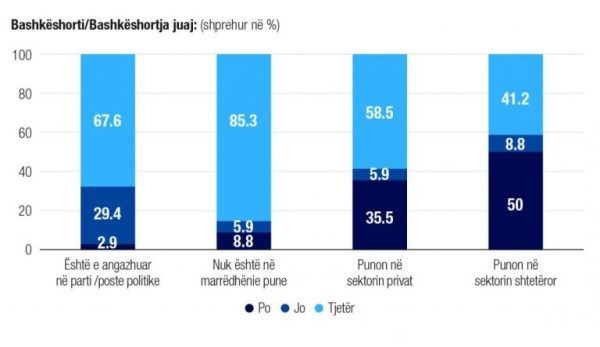 Even 44% of respondents oppose the current way and current salary calculation system by the Assembly because prevents them from holding regular electoral meetings, although most of them, nearly 85% have benefited from regular financial treatment, such as diets or royalties, extra payment except of their monthly salary of Lek 140,000 (€ 1150). The diets of the Chairperson, Deputy Chairpersons and MPs are at 4 percent of their monthly salary. Half of the respondents are against the penalties of the monthly salary in case of absence in the Parliament. As part of the privileges, 35 percent of MPs stated they had bought their car without paying the customs and 52% used the VIP room at Rinas Airport.